Although fast food restaurants seem less prevalent in our neck of the woods than in other regions of the country, it’s hard to picture a strip of suburban road, even in New England, without including a glimpse of those golden arches among the commercial landscape. Today, McDonald’s employs 1.7 million people in more than 33,000 restaurants in 119 countries. 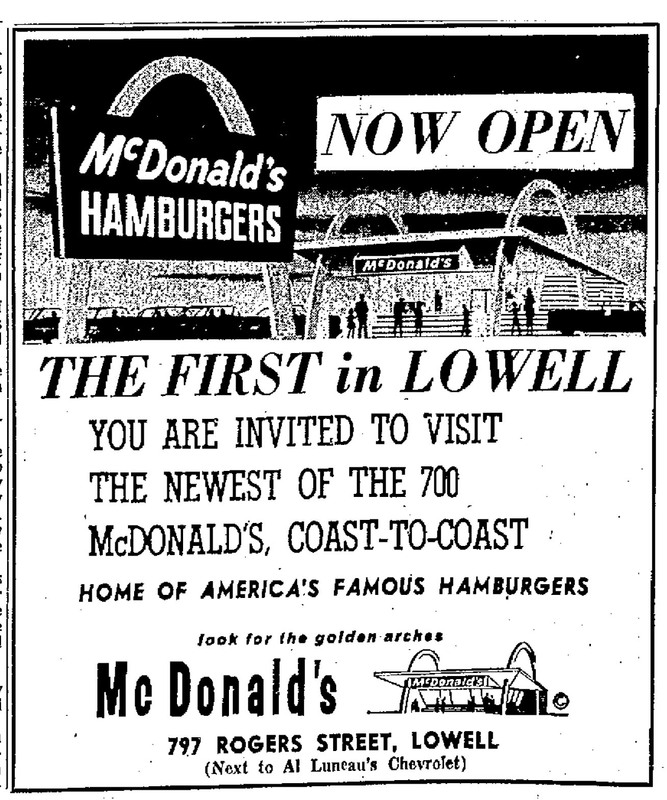 McDonald's opened its first restaurant in Lowell during the summer of '65, on Rogers Street - near the Tewksbury line. During the same year that McDonald’s opened its first Lowell-area restaurant in 1965, the chain also celebrated its 10th anniversary and became a public company with its initial public stock offering. 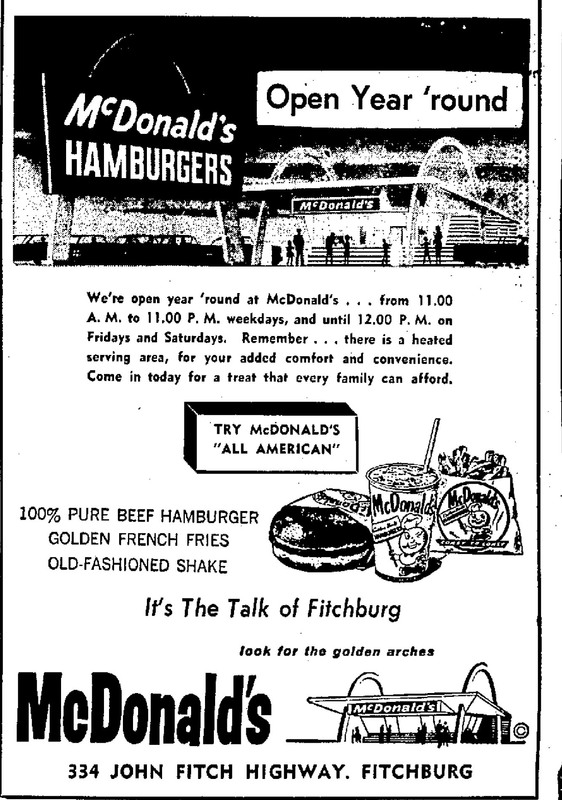 By 1965, McDonald’s had grown to 700 locations in the US and had become famous for its 15-cent hamburgers. No item on its menu of the mid-1960’s sold for more than 20 cents. McDonald’s strategy mirrored that of the Detroit automakers: churn out hamburgers with assembly line efficiency – high volume and low overhead. Then, hope that customers will continue to wait at the self-service window as long as they can continue to enjoy discounted prices. Even in the mid-60’s, a burger at fifteen cents was still a steal. The original model of the McDonald’s restaurant involved self-service windows, rather than today’s familiar eat-in restaurant (introduced in 1962) and drive-thru, which debuted at a McDonald’s located near a military base in Arizona so that soldiers would not need to violate a rule that prohibited them to leave their vehicles while wearing fatigues. McDonald’s first television advertisement hit the airwaves in 1966, the year after its entry into the Lowell, Massachusetts market. The ads below tout such forgotten McDonald’s delicacies as Roast Beef on a Roll and McDonald’s own Home Fried Chicken. There’s also a spot showcasing what’s since become a rare scene: kids piling into the back of a station wagon. In this era of car seats and seatbelt laws, there’s something nostalgic about the idea of sitting in the back of a station wagon with five or six of your favorite neighborhood friends. The second set of McDonald’s ads also dates from the late 1960’s, and captures the debut of the Filet-o-Fish, originally introduced to help revive flagging sales on the “meatless Fridays” practiced by Roman Catholics. Warning: The “McDonald’s is Your Kind of Place” tune is the sort of jingle that may stay stuck in your head for a while. McDonald's first location in Fitchburg, Massachusetts predated its Lowell location by several years. This ad dates from 1963. McDonald’s today has grown into a multinational corporation that brings what many view as a kind of “Americana” into countries far from America’s shores. Over the last 15 years, living in Western Europe for extended periods of time and spending stints of time in Latin America too, I sought out McDonald’s when I needed a temporary escape from the local fare. Whether you love them or not, it’s hard to deny that McDonald’s has had an indelible impact on American culture of the past fifty years. McDonald’s is your kind of place… that’s one of the earliest commercials I remember…..
Incidentally, the McDonald’s on Rogers St was a long-surviving example of the old-style McDonald’s…. when did they tear it down? I almost added that to the post, but couldn’t remember the exact year. I’d guess that old McDonald’s on Rogers Street survived into the very early 1980’s – maybe 1981 or 1982. Does anyone remember only boys were allowed to work at McDonald’s? And what year did that policy change?